Gilette is a speciality of the Medeville family since 1710 – unique in Sauternes, since the wine is aged for over twenty years in little cement tanks, and then another two to three years in bottle before it is released. This unusual way of working reinforces, by its long reduction, the natural fruit flavors of the wines of Preignac, with high citrus notes, and makes them almost immortal, carried by a sensational aromatic complexity and an ever-lasting finish. 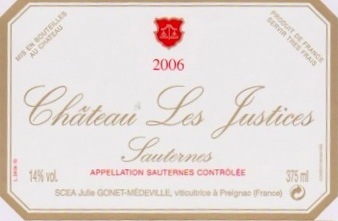 Great gastronomic pleasure – combining power, voluptuousness, and elegance – for this reason, the family’s newer vineyards at Les Justices justifiably over-deliver for the price. Varietal/Vineyard: 8.5 hectares planted to 90% Semillon, 8% Sauvignon Blanc, and 2% Muscadelle. One of the most consistent and best of the non-classified Sauternes – very fruit-forward, as is common for the wines of Preignac, complex and age-worthy, with a vivacious bouquet.